ProFlex is a microencapsulated concentrate containing lambda-cyhalothrin, novaluron, and pyriproxyfen. 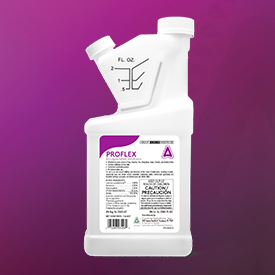 These three active ingredients provide three modes of action that make ProFlex your fast-acting and long-lasting solution for several hard to control pests including mosquitoes, cockroaches, fleas and ticks. Effective against ants (including red imported fire ants), bed bugs, cockroaches, crickets, earwigs, firebrats, silverfish, stinkbugs, fleas, ticks, flying insect pests, stored product pests, boxelder bugs, centipedes, millipedes, mosquitoes, pillbugs and sowbugs.